The mosaic was placed here to mark a significant date and to stimulate pride in our heritage. The border surround contains illustrations of items relevant to the period portrayed above or below. The first panel showing the ‘Dawn of Time’ is surrounded, for example, by fossils and early tools. The work starts with a representation of plant and animal life, man is seen knapping flints, and symbols depict the ancient earthworks at Otford Mount. Early Britons are represented by a Bodicea-type character, behind whom can be seen Invicta, the White Horse of Kent. The river represents the Darent. 744 sees the battle between King Offa of Mercia and Aldic of Kent followed in 1016 by the battle of Edmund Ironside and King Canute, where the river was said to run with blood. The border surround shows Anglo-Saxon bosses and chariot hubs, and coinage of Edward to Confessor. The first Christian church can be seen at this time, and the next panel representing 1100 to 1550 starts with a portrayal of Thomas a’Beckett and his miracles. A ground plan of the Palace with a gold mosaic overlay is seen, while a harvest is being gathered in the foreground. Behind Archbishop Warham a play is performed at the Palace; it is the time of the plague when many such festivities are held in an attempt to ignore the pestilence. The border contains images denoting death from the plague and brickwork with lettering devices from the Palace. A cricketer is shown in the next panel representing one of the earliest popular sports. Otford High Street is eclipsed by a train, illustrating the massive impact of the railway on a rural community. A soldier embracing his lady represents men leaving or returning in two world wars, and above them the Battle of Britain, 1940. Moving towards more recent times, the motorways now surrounding the Village are represented by a line of sodium lights on the horizon. The Pond is central to the final scene where the Great Storm of 1987 can be seen. The last image is of a mother taking fruit from the Tree of Knowledge and giving it to her son. He in turn, is handing it to a younger child. This symbolises the promise of a new generation and a better future. In the border of the final panel, the Registrar of Births circa 1660 is depicted, as well as a Village map of 1783, train tickets, spark plugs, car keys and, of course, 3 ducks from the Pond. At the very end of the mosaic can be seen the handprints of the oldest person in Otford and the youngest baby at 31st December, the last year of the century. 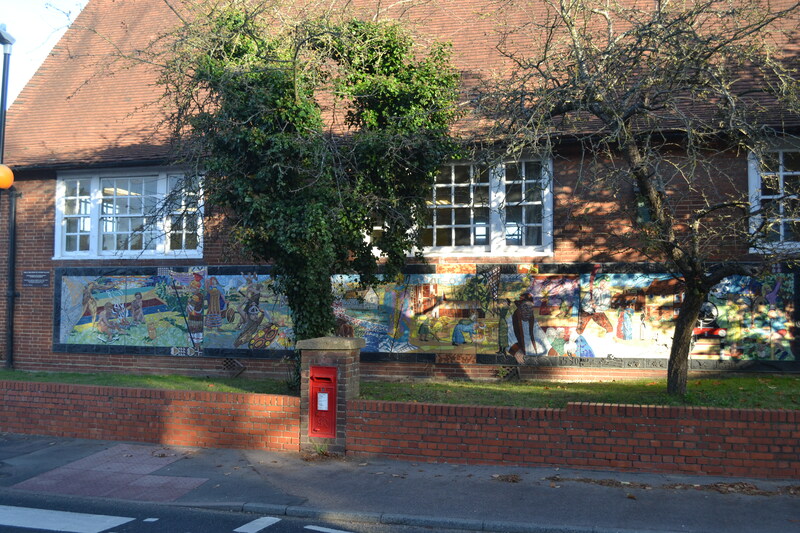 The late Brian Wright was instrumental in forming a committee and subsequently commissioning Oliver Budd as the mosaic artist. A Guide to the Otford Mosaic written by members of the Otford & District Historical Society and published by the Society is available from the Heritage Centre in the High Street, priced £5.